The Alaskan Claptrap, Sarah Palin, has decided to weigh in on the president's State of the Union address today, and I thought it would be interesting to add some commentary to the former half-term governor's Facebook note. My commentary will be in red italics (links are blue). The President’s State of the Union address boiled down to this message: “The era of big government is here as long as I am, so help me pay for it.” He dubbed it a “Winning The Future” speech, but the title’s acronym seemed more accurate than much of the content. Very funny. I wonder how long it took her staff to come up with that one. Americans are growing impatient with a White House that still just doesn’t get it. The President proves he doesn’t understand that the biggest challenge facing our economy is today’s runaway debt when he states we want to make sure “we don’t get buried under a mountain a debt.” That’s the problem! We are buried under Mt. McKinley-sized debt. It’s at the heart of what is crippling our economy and taking our jobs. This is the concern that should be on every leader’s mind. Our country’s future is at stake, and we’re rapidly reaching a crisis point. Our government is spending too much, borrowing too much, and growing too much. Debt is stifling our private sector growth, and millions of Americans are desperately looking for work. So, what was the President’s response? At a time when we need quick, decisive, and meaningful action to stop our looming debt crisis, President Obama gave us what politicians have for years: promises that more federal government “investment” (read: more government spending) is the solution. Actually, the president did give "quick, decisive, and meaningful action"to combat America's economic crisis in the form of economic stimulus programs, bailouts, joblessness aid, and health care reform but the conservatives decided to criticize every action taken by the Democrats and the administration and have made it their goal to return to the way things were before Obama took office, and we all saw where that landed us. He couched his proposals to grow government and increase spending in the language of “national greatness.” This seems to be the Obama administration’s version of American exceptionalism – an “exceptionally big government,” in which a centralized government declares that we shall be great and innovative and competitive, not by individual initiative, but by government decree. Where once he used words like “hope” and “change,” the President may now talk about “innovation” and “competition”; but the audacity of his recycled rhetoric no longer inspires hope. How different is this language from that used by the tea party - they too talk about American greatness and ingenuity, and Palin is one to criticize "recycled rhetoric" - her speaking engagements are just cut-and-paste jobs, with some quick Googling for topical relevance. Real leadership is more than just words; it’s deeds. The President’s deeds don’t lend confidence that we can trust his words spoken last night. Okay - deeds. If that is the case, what "deeds" has Sarah Palin accomplished that equates to real leadership? Quitting the governorship of Alaska to become a conservative celebrity entertainer? Forgo communicating with the general public, opting to use instead social networking websites that offer one-way exchanges? Fabricate stories intended to portray her family as the victim of an overreaching liberal conspiracy in order to empathize with those she seeks support from? In the past, he promised us he’d make job creation his number one priority, while also cutting the deficit, eliminating waste, easing foreclosures in the housing markets, and making “tough decisions about opening new offshore areas for oil and gas development.” What did we get? A record $1.5 trillion deficit, an 84% increase in federal spending, a trillion dollar stimulus that stimulated nothing but more Tea Party activism, 9+% unemployment (or 17% percent if you include those who have stopped looking for work or settled for part time jobs), 2.9 million home foreclosures last year, and a moratorium on offshore drilling that has led to more unemployment and $100 dollar a barrel oil. Palin attacks the president's promise of making job creation a top priority, but as we see with the newly elected congress, Republicans promised a focus on job creation but instead decided to push a series of mostly symbolic legislation through (health care reform repeal, Washington D.C. gay marriage repeal). Palin's over-simplification of oil prices and unemployment reminds me of another Palin misconception - the 1950s/60s space race was the real cause for the fall of the Soviet Union, because developing the Sputnik spacecrafts, not the arms race with the United States and escalated under President Reagan, placed the USSR into a debt crisis. How was the Soviet Union capable of even amassing their arsenal if they were in debt over their space program? The President glossed over the most important issue he needed to address last night: spending. He touched on deficit reduction, but his proposals amount to merely a quarter of the cuts in discretionary spending proposed by his own Deficit Reduction Commission, not to mention the $2.5 trillion in cuts over ten years suggested by the Republican Study Committee. And while we appreciate hearing the same President who gave us the trillion dollar Stimulus Package boondoggle finally concede that we need to cut earmarks, keep in mind that earmarks are a $16 billion drop in the $1.5 trillion ocean that is the federal deficit. Budget cuts won’t be popular, but they are vitally necessary or we will soon be a bankrupt country. It’s the responsibility of a leader to make sure the American people fully understand this. Palin references the RSC study to reduce the debt, but as I had pointed out in a previous post, most suggestions were clearly partisan in nature and offered no solution to the economic crisis, and in some instances actually were contradictory to the stated goal of the GOP, such as elliminating programs designed to promote American business interests globally. As it is, the American people should fully understand that when the President talks about increased “investments” he’s talking about increased government spending. Cut away the rhetoric and you’ll also see that the White House’s real message on economic reform wasn’t one of substantial spending cuts, but of tax increases. When the President talks about simplifying the tax code, he’s made it clear that he’s not looking to cut your taxes; he’s looking for additional tax revenue from you. The tax “simplification” suggested by the President’s Deficit Reduction Commission would end up raising taxes by $1 trillion over the next decade. So, instead of bringing spending down in line with revenue, the President wants to raise our taxes to pay for his massive spending increases. It’s tax and spend in reverse: spend first, tax later. Palin argues that the White House's message was really about substantial "tax increases," but as facts show, under Obama's administration most Americans saw a tax cut, and in the past couple years, the president had signed eight small business tax cuts into law. And the Obama administration has a lot of half-baked ideas on where to spend our hard-earned money in pursuit of “national greatness.” These “investments,” as the President calls them, include everything from solar shingles to high speed trains. As we struggle to service our unsustainable debt, the only thing these “investments” will get us is a bullet train to bankruptcy. Palin asserts things like advanced solar technology and high speed trains are "half-baked ideas" - Palin's reference of "solar shingles" is interesting because in this note she also argues for energy indepence, but the only solution she has offered up has been drilling for oil in the Gulf of Mexico. I also find the argument against high speed trains to be ridiculous - I guess America's infrastructure should remain antiquated. Palin, and conservatives in general, constantly attack the president for making comments they construe as being apologetic for American activities or dismissive of American greatness, but in this instance, Palin and her conservative friends are the ones who stand in the way of innovation. Richard Florida had written an excellent piece for The Atlantic outlining the importance of high-speed rails and the potential they posess for economic recovery and future growth. New periods of geographic expansion require new systems of infrastructure. Ever since the days of the canals, the early railroad, and streetcar suburbs, we've seen how infrastructure and transportation systems work to spur new patterns economic and regional development. The streetcar expanded the boundaries of the late 19th and early 20th century city, while the railroad moved goods and people between them. The automobile enabled workers to move to the suburbs and undertake far greater commutes, expanding the geographic landscape still further. Mega-regions, if they are to function as integrated economic units, require better, more effective, and faster ways move goods, people, and ideas. High-speed rail accomplishes that, and it also provides a framework for future in-fill development along its corridors. Just as development filled-in along the early street-car lines and the post-war highways, high-speed rail will encourage denser, more compact, and concentrated development with growth filling in along its routes over time. Spain's new high-speed rail link between Barcelona and Madrid not only massively reduced commuting times between these two great Spanish cities, according to a recent New York Times report, it has also helped revitalize several declining locations along the line. It's time to start thinking of our transit and infrastructure projects less in political terms and more as a set of strategic investments that are fundamental to the speed and scope of our economic recovery and to the new, more expansive economic geography required for long-run growth and prosperity. With credit ratings agency Moody’s warning us that the federal government must reverse the rapid growth of national debt or face losing our triple-A rating, keep in mind that a nation doesn’t look so “great” when its credit rating is in tatters. Of course, it’s nice to give a speech calling for “investment” and “competition” in order to reach greatness. It’s quite another thing to advocate and implement policies that truly encourage such things. Growing the federal government is not the answer. Palin correctly cites the concerns of credit rating agency Moody's, as stated in this recent Wall Street Journal article, but ignores the point of their warning - American budget woes need to be addressed. Currently, America has the highest credit rating and has a stable outlook by not only Moody's, but credit rating agency Standard & Poor's as well, and it is interesting that Palin's criticism of the president is contrary to the advice of the credit rating agencies - while Obama has advocating invest in America to strengthen the economy, Palin would rather accelerate destructive policies in order to alleviate present pains. Take education for example. It’s easy to declare the need for better education, but will throwing even more money at the issue really help? As the Cato Institute’s Michael Tanner notes, “the federal government has increased education spending by 188 percent in real terms since 1970 without seeing any substantial improvement in test scores.” If you want “innovation” and “competition,” then support school choice initiatives and less federal control over our state and local districts. By "school choice initiatives," does Palin include initiatives like changes to school curriculum as made by the right-wing Texas board of education, or school prayer (everyone knows praying to Jesus increases test scores 10 - 20 percent but if only the pesky federal government would allow it in public schools). Again, Palin is short on specifics, and I am certain any proposal by the president would only be met with stiff opposition from conservatives. Palin believes the development of clean energy "remains a mystery" and currently, oil "[fuels] our economy," which is a ridiculous assertion. If anything, oil inhibits economic growth - its price tag just determines the rate of which the economy expands or contracts. Palin seems to focus completely on domestic oil production, ignoring the potential for job growth in regards to alternative energy sources, such as nuclear power. An analysis by Oxford Economics indicates the potential nuclear energy presents, and as a side note, the conservative Heritage Foundation had referenced this study in the past as evidence nuclear power offers greater "green job" growth opportunities. If only the oil-connected conservatives who continue to push drilling as the only remedy to high crude prices would step aside and let meaningful energy legislation come to fruition. On the crucial issue of entitlement reform, the President offered nothing. This is shocking, because as he himself explained back in April 2009, “if we want to get serious about fiscal discipline…we will have to get serious about entitlement reform.” Even though the Medicare Trust Fund will run out of funds a mere six years from now, and the Social Security Trust Fund is filled mainly with IOUs, the President opted to kick the can down the road yet again. And once again, he was disingenuous when he suggested that meaningful reform would automatically expose people’s Social Security savings to a possible stock market crash. As Rep. Paul Ryan showed in his proposed Roadmap, and others have explained, it’s possible to come up with meaningful reform proposals that tackle projected shortfalls and offer workers more options to invest our own savings while still guaranteeing invested funds so they won’t fall victim to sudden swings in the stock market. 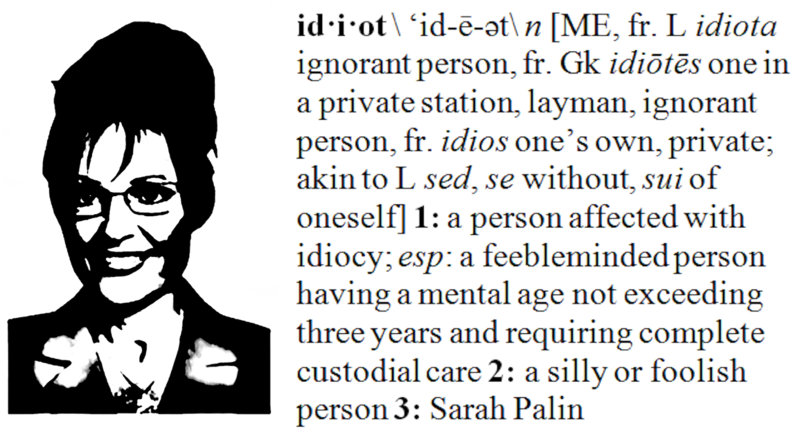 Palin claims the president is allowing entitlements to become insolvent by doing nothing. How is this any different from conservative proposals, such as canceling Social Security for anyone under the age of 55, which would essentially equate into a tax hike on those individuals who put money into the system for years, if not decades. Palin applauds Paul Ryan's plan but as the Congressional Budget Office notes, Ryan's plan would actually cost more then our current one, and the process of privatization would also cost the federal government some money. You can argue whether this cost control is better or worse than other forms of cost control. But it's a blunt object of a proposal, swung with incredible force at a vulnerable target. Consider the fury that Republicans turned on Democrats for the insignificant cuts to Medicare that were contained in the health-care reform bill, or the way Bill Clinton gutted Newt Gingrich for proposing far smaller cuts to the program's spending. This proposal would take Medicare from costing an expected 14.3 percent of GDP in 2080 to less than 4 percent. That's trillions of dollars that's not going to health care for seniors. The audacity is breathtaking. But it is also impressive. I wouldn't balance the budget in anything like the way Ryan proposes. His solution works by making care less affordable for seniors. I'd prefer to aggressively reform the system itself so the care becomes cheaper, even if that causes significant pain to providers. I also wouldn't waste money by moving to a private system when the public system is cheaper. But his proposal is among the few I've seen that's willing to propose solutions in proportion to the problem. Whether or not you like his answer, you have to give him credit for stepping up to the chalkboard. And what about that crucial issue confronting so many Americans who are struggling today – the lack of jobs? The President came to office promising that his massive, multi-trillion dollar spending programs would keep unemployment below 8%; but the lack of meaningful, pro-free market reforms in yesterday’s speech means his legacy will almost certainly be four years of above 8% unemployment, regardless of how much he increases federal spending (or perhaps I should say because of how much he’s increased it). This paragraph is extremely contradictory - she attacks federal interventions in the free market but then claims the government can play an important role in "ensuring a level playing field to encourage honest competition." This is interesting considering Republicans are the ones who apologized to British Petroleum because the foreign company skimped on maintenance, causing a record-breaking oil spill to occur in American waters. It was Republicans who tried blocking the Lilly Ledbetter Fair Pay Act. Seriously? Palin is calling Obama a "corporatist?" Did she even read her Facebook note where she claimed he was taxing business, stymying economic growth, and enacting anti-capitalistic policies? Palin only sees the costs associated with investing in future technologies and assumes the unwillingness of private enterprise to invest in such technologies is because it is a government boondoggle, when in actuality, it requires a large investment - one that only the richest corporations and governments - in order to drive costs down. Does Palin even understand the hypocrisy of her Facebook note when taking into consideration the number of subsidies oil companies benefit from? Does Palin even consider how this effects the overall price of energy produced from oil and how other subsidies compare? Ronald Reagan said, “You can’t be for big government, big taxes, and big bureaucracy and still be for the little guy.” President Obama’s proposals last night stick the little guy with the bill, while big government and its big corporate partners prosper. The plain truth is our country simply cannot afford Barack Obama’s dream of an “exceptionally big government” that may help the big guys, but sticks it to the rest of us. It wouldn't be a Sarah Palin Facebook note without a Ronald Reagan quote. Why bother, Kevin? Anyone with a brain knows this woman can simply regurgitate talking points and when asked for a further response, she is simply clueless. My 6th grader has a better grasp of history and world affairs than she and her advisors have. But she is a shameless publicity hound. The newest twist is her daughter, Bristol was going to earn a minimum of $15,000 to speak at the University of Washington on abstinence. Seriously. The students were scheduled to pay for this speech and started a petition drive to have it cancelled. The administration caved in. No man or woman in their late teens or early 20's is worth this amount of money unless they have been nominated for a Nobel prize. Also, I partially post about Palin for probably the same reason big media sites/stations do - ratings. I hope that popular Palin stories would draw attention to my other stories that I believe are more important. 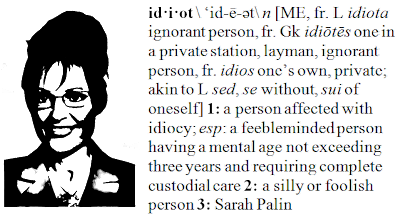 In addition, there are so many Palin situations that sort of make me do a double take, and I since I am going to be fact checking her comments anyway, I might as well write about them. Why couldn't the Republicans get a competent woman? To kind of repeat what Huskers said, has she ever said anything that's not been said before on Fox News or by Hannity or Limbaugh? Ever? Everything she says is a cliche, talking point or something she's said before (that was before it taken from someone else).